One of the enjoyable parts of embarking on an interior design project for your office or commercial space is getting to choose the colours and materials that will make up your new working environment. The skill comes from knowing how to put all of these elements together to create a well-laid out space, which offers a nice environment for staff and clients alike. One way in which this can be achieved is to use contrasting floor coverings to distinguish between areas, which works especially well within open plan office environments. Flooring can be used for different purposes, from creating a safe, slip free environment, to a luxurious and opulent space. 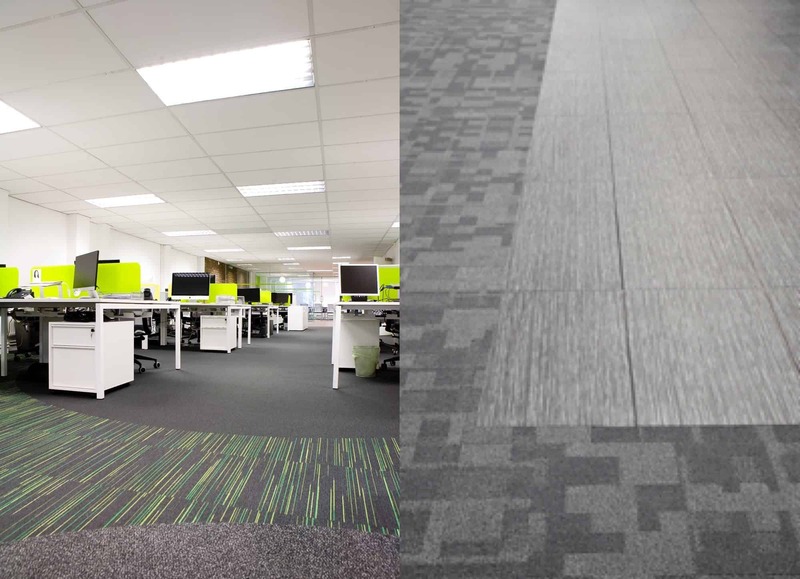 Even within one building there will be the opportunity to use different types, textures and colours of floor covering, whether it’s to differentiate between a break-out area, Kitchenette, Boardroom or walkway. Within a large open plan office you may want to distinguish between departments, with a subtle change in colour or a patterned verses plain carpet tile. 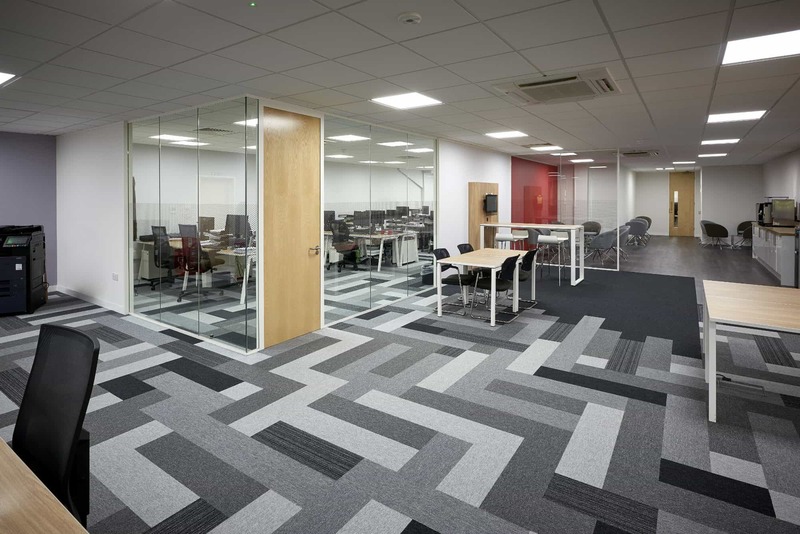 Within an open plan office environment we would suggest using contract grade carpet tiles, which are hard wearing and easy to replace in a small area, if needed. Another benefit of contract grade carpet tiles is the vast choice of colours, styles and shapes that can be used to create impressive designs. We can now choose from planked carpet tiles, offering more ways to design flooring layouts, create zones and add flashes of colour. Luxury Vinyl Tiles (LVT), which are available in ranges that offer the aesthetics of real wood and stone, can be used in partnership, alongside carpet tiles, without causing a trip hazard. This can work well as a clear way to distinguish between a Reception and office area, a Kitchen within an open plan office or a walkway within an office. At Meridian Interiors, we are experts in design and planning and would be happy to help you with all aspects of your interior refurbishment, especially discussing all of the possible flooring options and how it can make your refurbishment come to life!